From the time Jesus was arrested on Maundy Thursday evening until he died Friday afternoon, less than a day passed. Jesus had shared a last meal with all of his disciples, and soon after was arrested. From then on, he was no longer among friends. In those hours of his greatest suffering, there is no record of his even being allowed a visit. The only contact we know of is a sad glance across the courtyard to Peter after Peter denied even knowing Jesus; and a few words to his mother and his disciple John at the foot of the cross. Other than that, Jesus was surrounded by enemies, by people who either wanted him dead, or were willing to let it happen. Who was it that was with Jesus most in those last hours? It was not his friends. Nor was it any one of the authorities. Jesus appeared briefly before each of them as he was dragged around from one to the other. But for the entire time, from his arrest until his death, Jesus was with Roman soldiers. They made the arrest, they escorted him before the various authorities, they carried out Pilate’s order to have Jesus flogged, and then, when the crucifixion order was given, they led Jesus to Golgotha, nailed him to the cross, and stood guard until he was dead. We don’t know if it was the same soldiers all the while, but as a group, it was they who were with Jesus the most. We see in these soldiers three different reactions to Jesus. First, we see excessive cruelty. In the flogging and then the crucifixion of Jesus, the soldiers were carrying out cruel orders. But their cruelty went far beyond that. In the times between appearances before the authorities, the soldiers made fun of Jesus, mocking him as king. They made a crown of thorns, and pushed it down onto his head. They blindfolded him and punched him from all directions. They insulted him and bowed down before him in fake worship. They spit on him and called him names. Sometimes the evening news has videos of the police beating someone they are arresting. They are then accused of using excessive force and must stand trial. In court their lawyers will sometimes describe the criminal’s violent or threatening behavior that provoked the attack. Then a jury must decide whether or not the violent response of the police was justified or unnecessarily cruel. In the case of Jesus, it is absolutely clear that he did not provoke the soldiers. They came to arrest him with swords and spears and clubs. Jesus told them that none of that was necessary, agreeing to go peacefully. When the impulsive Peter took out a sword and cut off a man’s ear, Jesus told him to put the sword away, and healed the man’s ear. Most of the time, Jesus did not even speak in his own defense, let alone resist arrest or provoke an attack. Yet, the soldiers reacted to this quiet, peaceful dignity with harsh, humiliating cruelty. The second reaction to Jesus by the soldiers was one of indifference. 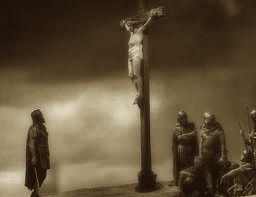 After Jesus was nailed to the cross, the soldiers had nothing to do there but stand guard until Jesus and the other two men on the other crosses were dead. The crowd showed no signs of causing any trouble, so the soldiers were able to do a little gambling to pass the time, ‘casting lots’ to decide who would get Jesus’ garments. Here these men are, on the scene of the greatest event in human history, and they are not even paying attention. Instead, they pass the time by gambling. That crucifixion and the resurrection which followed still have ultimate significance for all people. Our eternal destiny is determined by our reaction to that Jesus who there died and rose from the dead; and the reaction of many people today is the same as the soldiers– indifference. I can understand someone who struggles to believe. Some of the greatest heroes of faith in the Bible had their struggles with faith. But it is difficult to understand one who will not even pay any attention to the truth being told here and the eternal life being offered here in this story. There is a third reaction among the soldiers who were with Jesus. Mark 15:39 says, “And when the centurion, who stood there in front of Jesus, heard his cry and saw how he died, he said, ‘Surely, this man was the Son of God!’” This man’s reaction was to be converted from unbelief to faith. I have been describing the soldiers as a group, implying that all were cruel and that none paid any attention. We have no way of knowing even how many soldiers there were, let alone which ones did what. Perhaps not all were cruel, and at least one was paying attention— the verse says this centurion’s reaction came ‘when he saw how he died.’ He had been watching Jesus. This is what often happens when one begins to pay attention. The indifference that was shown by most of the soldiers would never lead anyone to faith. How could it? They were not even looking at what was going on. But this centurion was looking, and as the verse says, it was when he SAW how Jesus died that he became convinced this was no ordinary man. A pastor friend of mine several years ago was diagnosed with terminal cancer. One of his parishioners, also a friend of mine, said, “Ted will show people how to die.” What he meant was Ted would show people how to die with the faith that gives someone courage and hope, even in the valley of the shadow of death. That centurion saw Jesus endure insults and injuries with quiet dignity and courage. He saw Jesus, the condemned man, take charge of the conversation with Pilate, the ruler who held Jesus’ fate in his hands. He saw Jesus forgive those who just nailed him to a cross. The centurion saw Jesus give a word of comfort and hope to a thief dying next to him. He saw Jesus pray to God on the cross, and then commit his spirit into God’s hands. That centurion saw many men die, but he never saw anything like this, and he said, “Truly, this man was the Son of God.” The Holy Spirit cannot respond to indifference, but the Spirit can work faith in the hearts of those willing to pay attention to Jesus. Mark 15:16-20 — The soldiers led Jesus away into the palace (that is, the Praetorium) and called together the whole company of soldiers. They put a purple robe on him, then twisted together a crown of thorns and set it on him. And they began to call out to him, “Hail, king of the Jews!” Again and again they struck him on the head with a staff and spit on him. Falling on their knees, they paid homage to him. And when they had mocked him, they took off the purple robe and put his own clothes on him. Then they led him out to crucify him. Lord Jesus Christ, Son of the Living God, have mercy on me a poor sinner.